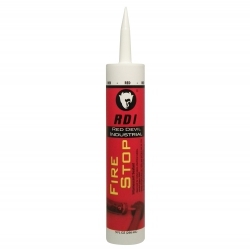 FIRE STOP LC150RD Sealant is a versatile intumescent product intended for firestopping a wide array of applications in small commercial or grouped residential construction or other structures with similar applications. It seals penetration openings against the spread of fire, smoke, gases and water. LC150RD is fully tested to ASTM E814 (UL1479) and meets Class A finish requirements for Flame Spread and Smoke Development when tested in accordance with ASTM E84 (UL723). LC150RD provides up to a 2 hour fire rating for typical service penetrations through concrete or wood floors, concrete or masonry walls, as well as gypsum board walls. LC150RD is also acoustically tested, demonstrating excellent sound attenuation properties. • Nonmetallic Pipes, Conduits & Tubing including PVC, CPVC, ABS, and PEX. • Electrical & Electronic Cabling including service entrance, power distribution, computer, telephone, television. • Metal Ductwork including HVAC, bath and dryer vents. • Insulated Pipes including heating, cooling, and condensation applications. • Complete Wood Floor firestopping package for electrical, plumbing, HVAC, telephone, and television.